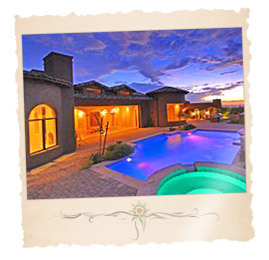 Pima Canyon Estates is the pinnacle of Arizona foothills living. It exists in harmony with lush, scenic surroundings. It is the stage for a dramatic, continuing history and a special niche, blending man with nature. And its distinct Arizona design has ensured it an elite place among the Southwest's most dynamic communities. Pima Canyon Estates is placed against the edges of the Coronado National Forest and the southern range of the Santa Catalina Mountains. 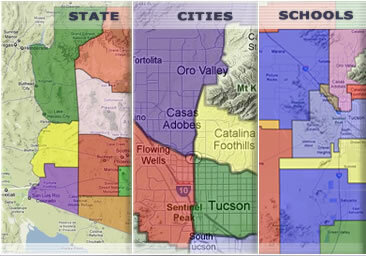 To the north is over 255,000 acres of protected Arizona desert highlands. To the south, the city lights sparkle on the night horizon. And panoramic mountain landscapes roll out in every direction. From your window, you'll marvel at the majestic saguaro silhouetted against the blaze of a dazzling Arizona sunset. Developed Pima Canyon Estates is an exclusive Arizona gated community set at the mouth of one of Tucson's most pristine canyons. Designed to protect the value and integrity of this unparalleled environment, this rare Pima Canyon Estates community offers 300 Arizona home sites on 450 acres to craft your one-of-a-kind Arizona home. From around $1,000,000 to multi-million dollar Arizona luxury homes, every generous home site retains its advantaged angle to sweeping cityscapes and rugged foothill views. Rigorous architectural design guidelines ensure that every Arizona home blends with the environment and the Pima Canyon Estates community. As you'd expect, all utilities have been placed underground. Plus, the Pima Canyon Estates community walking trails connect to exclusive trailheads leading into the Santa Catalinas. 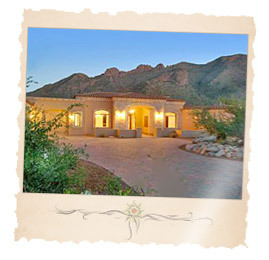 Pima Canyon Estates is an exceptional Arizona gated community in the Catalina Foothills. Every home has million-dollar views of the Santa Catalina Mountains, city lights or both. Arizona homes in Pima Canyon Estates are dramatic in architecture and rich in features making Pima Canyon Estates one of the most exclusive neighborhoods in Tucson. The tools to begin your new Pima Canyon Estates Community Arizona homes search are right at your fingertips! To get started, simply click on the quick link above or browse Arizona new construction homes and houses for sale using the links to the right. Find a new Pima Canyon Estates Community Arizona home for sale or locate a home builder in Arizona on MyOwnArizona.com. Our MyOwnArizona™ Pima Canyon Estates Community real estate guide showcases new Arizona construction homes, townhomes, condos and new Arizona communities by new home builders throughout the State of Arizona. Find new homes by map, desired home price or by browsing new developments and floor plans by lifestyle or home type. All home listings include home price, location and money saving incentive offers to make buying a new Pima Canyon Estates Community Arizona home more affordable. All houses for sale listed include floor plans, pictures and many offer tours of the new homes and communities. Contact us at: info@MyOwnArizona.com for Arizona & Pima Canyon Estates Community in Tucson, AZ real estate.